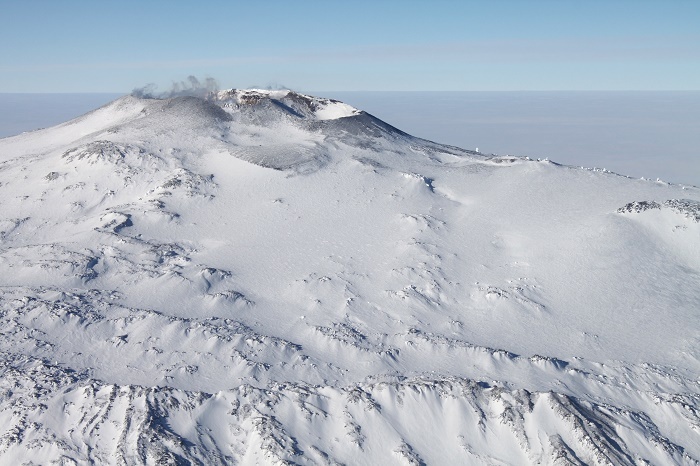 Mount Erebus is the second highest, however, most active volcano that is located on Earth’s southernmost continent, Antarctica, making the volcano too the southernmost active volcano on the planet. 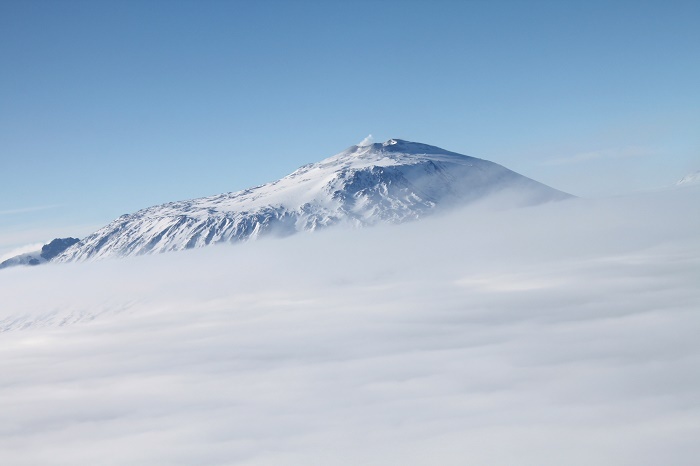 With elevation of 3,794 meters (12,448 feet) altitude above sea level, it is located on Ross Island where the summit of the volcano contains a persistent convecting phonolitic lava lake, which is one of five long-lasting lava lakes on Earth. As a matter in fact, that lava lake has an average temperature of 927 degrees Celsius (1,700 degrees Fahrenheit) making it one of the hottest places in the coldest places on Earth. 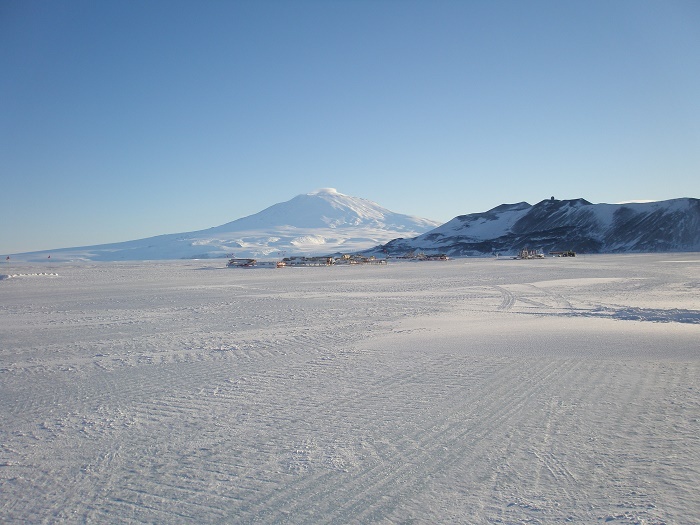 Still, the interior of the stratovolcano is extremely hot, however, on the exterior, one would freeze very quick since the Antarctic temperatures can be brutally cold. 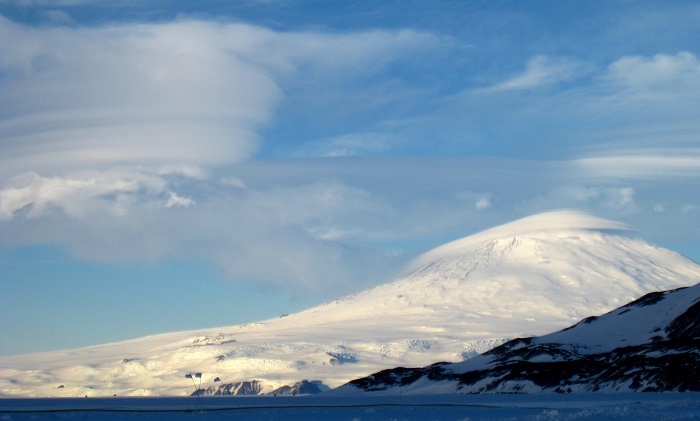 The volcano is scientifically remarkable in that its relatively low-level and unusually persistent eruptive activity enables long-term volcanological study of a Strombolian eruptive system very close, even hundreds of meters, to the active vents. 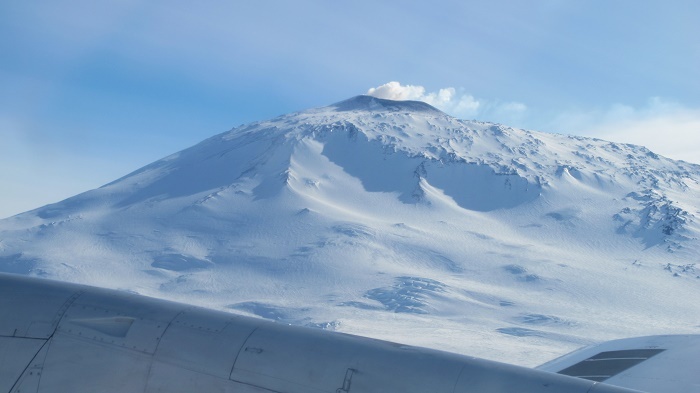 Being discovered in January 1841 by the polar explorer Sir James Clark Ross, eventually naming it Erebus after his ships, Erebus and Terror, it was evident to say at that time that it was a volcano since it was erupted. 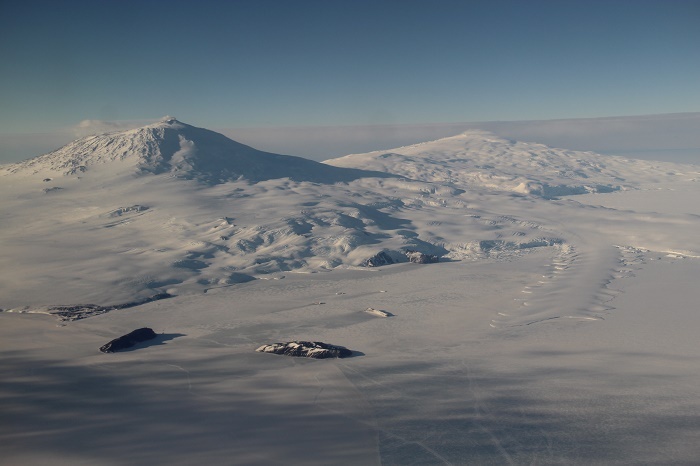 In 1908 according to some, Mount Erebus was unsuccessfully ascended for the first time by members of Sir Ernest Shackleton’s party; Professor Edgeworth David, Sir Douglas Mawson, Dr Alister Mackay, Jameson Adams, Dr Eric Marshall and Phillip Brocklehurst. The first official and successful ascent was done by Roger Mear on 7 June 1985, who was the first solo climber, and incredibly enough, done in wintertime. 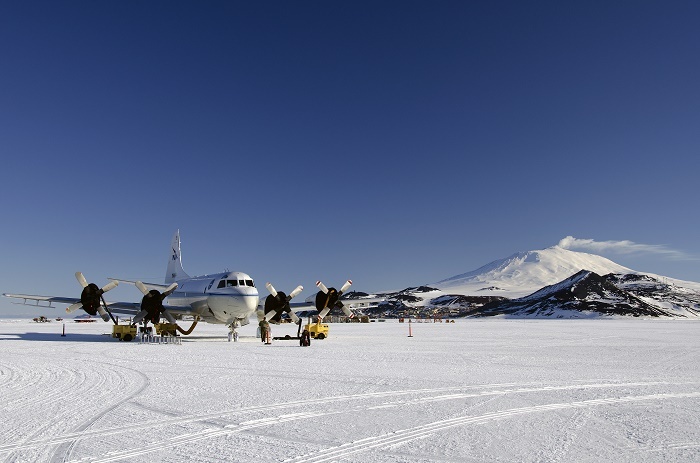 Being one of the most isolated places on the planet, it is known also for the tragic air disaster of the Air New Zealand Flight 901 which was done by a DC-10 airliner, and soon after it was already coined also as the Mount Erebus Disaster. The flight was scheduled for a sightseeing service from Auckland, New Zealand to Christchurch, New Zeland, and then returning again in Auckland. The flyover service has been already operation since 1977, with no problems at all, until 28 November 1979 when due to whiteout conditions and navigational error, 257 people aboard have been killed. 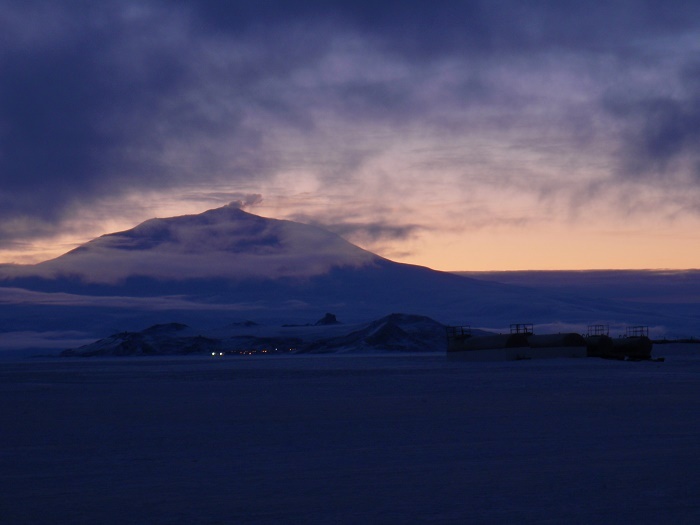 Right away the flyovers for Antarctica sightseeing have been discontinued, making the flight on 17 February 1980 the last one ever. Even though there were extensive recoveries and clean up missions, debris is still visible on the volcano, and the unclaimed remains of the crash victims are entombed at a memorial at the Waikumete Cemetery in West Auckland, New Zealand where every year a wreath is laid in their memory. Definitely something quite unique that deserves to be seen in person, where it is always on, bubbling, releasing gas and flinging volcanic bombs which can be so dangerous, yet, making it quite magnificent for a lifetime memory to be shared with the world.